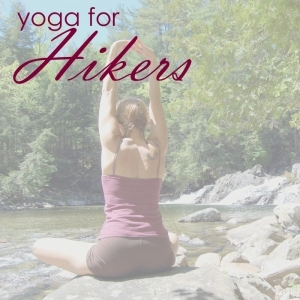 If you are new to hiking, getting back into it, or building up to a long hike or backpacking trip, your body will thank you for practicing these yoga poses on days between hikes. This sequence strengthens your hips, low back, shoulders, knees, calves, ankles and feet. Additionally, take fast-paced, aerobic walks, 20 to 45 minutes each, two to three times each week. With adequate conditioning, you can enjoy longer and more difficult hikes, injury-free, for even better summit views. Warm up with two or three gentle Sun Salutations before moving into these poses. From hands and knees, move your hands forward and lift your hips, straighten your legs and drop your heels toward the ground. Keep your tailbone lifted while stretching up out of your wrists, elbows and shoulders, letting your chest drop toward ground. Relax your neck and gaze at your knees. Hold for two to five breaths as your spine lengthens. From hands and knees, step your right foot forward between your hands, directly under your bent knee. Curl your left toes under and lift the left knee, straighten your leg and press through the left heel. Lift onto your fingertips and draw your heart forward and up. Look ahead for a breath. Repeat with your left foot forward. Standing, step your left foot back. Keep your hips squared and angle your left toes forward. Bend your right knee until it lines up with your ankle. Lift your heart and extend your arms overhead. Hold for two to five breaths. Repeat on the other side. Standing, step your left foot back and turn your hips and torso to open to the left. Turn your left toes toward the left side. Bend your right knee until the knee is directly over your ankle. Lift your arms to shoulder height in the same line as your legs. Gaze over your right fingers and hold for two to five breaths. Repeat on the other side. Stand in a straddle with your toes angled outward. Bend your knees over your toes and, keeping your torso erect, lower your hips until your thighs are parallel to the ground. Reach your arms overhead, then bend your elbows and lower them to shoulder height. Draw your shoulder blades together to open your chest. Hold for two to five breaths. Stand in a straddle with your toes angled outward. Bend your knees over your toes and, keeping your torso erect, lower your hips until your thighs are parallel to ground. Press your hands into tops of your thighs, fingers forward. Lift your shoulders toward your ears as your hips sink lower. Hold two to five breaths. Stand with your feet under your hips. Lift your arms overhead. Bend your knees, reach your tailbone back and lift your heart. Hold two to five breaths. Stand on your right leg. Bend your left knee and open the knee to the left side. Bring the bottom of your left foot to your right calf (or into your right thigh, provided you can get your toes higher than your knee). Lift your arms overhead. Gaze at a focal point and balance for at least two breaths, then repeat on the other side. Stand on your right leg. Extend your left leg back, as straight as possible, with your left foot flexed. Lower your torso and lift your left leg until both are parallel to the ground. Extend your arms back slightly away from your sides like wings. Gaze at a focal point on the ground slightly ahead of you and balance for at least two breaths. Repeat on the other side. From hands and knees, reach your feet back with your toes on the ground and your legs as straight as possible. Keep your shoulders over your hands and reach through your heels. Engage your core muscles to hold your hips in line with your shoulders and heels. Hold at least two breaths. Lay face-down with your chin on the ground, your elbows bent and your hands under your shoulders. Press the tops of your feet into the ground and lift your chin and the top of your chest as high as is comfortable. Relax your shoulders back and reach through the crown of your head. Hold at least two breaths. Lay face-down with your chin on the ground, your elbows bent and your hands on either side of your chest. Lift your feet, your chin, and the top of your chest. Keep your gaze at the ground slightly in front of you. Hold at least two breaths. Sit with your legs bent and your feet on the ground. Rest your hands on the ground on either side of your hips. Lengthen your spine, lean back slightly, and lift your feet until your calves are parallel to the ground. Lift your hands and reach toward your feet. Hold at least two breaths. Sit with your knees bent and your feet on the ground. Bring your hands to the ground slightly behind your hips, fingers pointing toward the hips. Lift your hips off the ground until your body, you’re your shoulders to your knees, is parallel to the ground. Press your arms straight and drop your head back to gaze up. Press your knees forward to lengthen the front of your body. Hold at least two breaths. Lay on your back with your knees bent over your hips and the lower legs parallel to the ground. Interlace your fingers behind your head and open your elbows to the sides. Keeping your feet flexed, press your right foot forward and straighten that leg while lifting your head and shoulders and twisting your torso to bring your right elbow to the left knee. Return to the starting position, then extend your left leg and bring your left elbow to the right knee. Repeat as many times as desired. Always end your yoga practice with a final relaxation. While practicing on your own is good, yoga is awesome in a group. Find some hiking friends and head to your nearest yoga studio for a class. In the Adirondack High Peaks region, join me or another talented teacher at True North Yoga. 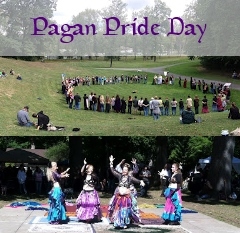 Today I am in Syracuse, New York, to lead “Elemental Yoga” at the annual Central New York Pagan Pride Day festival. My workshop is from 10:00 to 10:45 a.m. Afterwards I get to spend the remainder of the day connecting with and learning from others who, like me, look to nature for their spiritual inspiration. Pagans are an eclectic group; their diversity makes them interesting and fun. Their practices may be formal and structured or spontaneous and casual. There are numerous subsets under the Pagan umbrella. Pagans may worship deities from classical or tribal mythology, practice shamanism or magick, view futurology, community or ecology as religion, focus on the Divine Feminine, or simply venerate natural phenomena. Most chose their spiritual paths, rather than following the religions of their families. 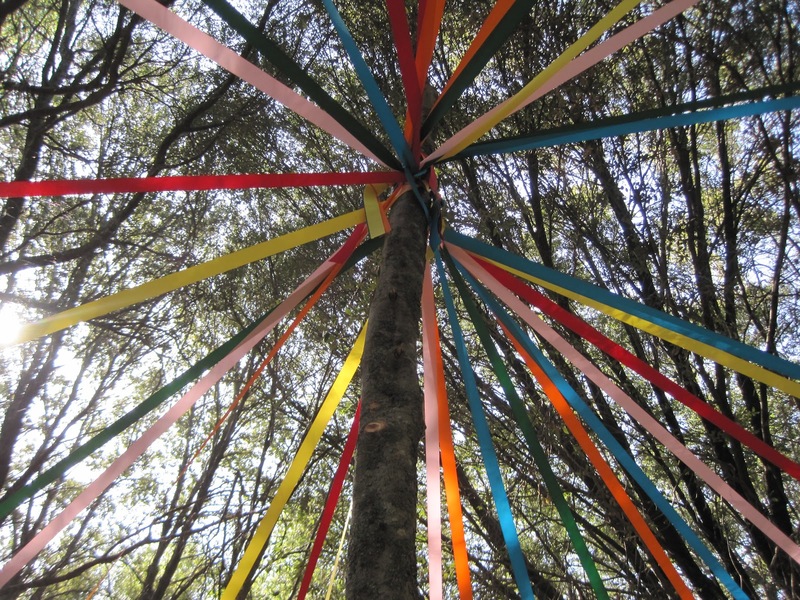 At today’s festival we’ll be celebrating the upcoming autumn equinox, as well as doing lots of networking and community building. My husband will be manning the Adirondack Earth Lore booth to showcase his amazing woodturning, and I’ll be hanging out there discussing yoga and healthy living with anyone who will listen. We’ll do some drumming. I’ll watch bellydancers. And I’ll be showing folks how to connect with the energies of Earth, Air, Fire and Water with yoga. In the area? Come on over to Onondaga Lake Park and join the fun! Arm rotations in tree pose require extra focus. When I decided to combine my yoga teacher training and personal trainer certification and teach a yoga with weights class, I looked around at the programs out there and couldn’t find one that satisfied me. Instead of taking a training that did not offer everything I was looking for, I created my own. My Earth & Fire: Vinyasa Flow Yoga with Weights classes are structured to be safe and designed to stabilize the core in every pose or movement. I borrowed from yoga, pilates and weight training and built all the moves into a flow. Keep it light. Yes, you should keep your attitude light, but what you really need to do is choose light hand weights. If you’ve never worked with weights before, 1 or 2 pound weights are enough. If you have, pick a weight that is less than you usually lift. When you are holding your arms out with a weight in each hand in Warrior II, you don’t want to be slowly tearing your rotator cuff. Since you’ll have to focus on holding a pose as well as what is going on in your arms, it’s safer to downsize your weights. The weights I offer my classes max out at 5 pounds. Engage your whole body. As you are pressing weights overhead in Warrior I, is your alignment degrading? The weights are just one part of what’s going on. Ground through your legs and feet and always, always, always use your core muscles. Maintain a neutral pelvis and support the low back by drawing the lower abdominals in and up and tucking your tailbone. Keep the shoulder blades down unless you are targeting their movement. Bring your chin down until your ears are directly above your shoulders and keep the neck as soft as possible. The true challenge of practicing yoga with weights is not the number of reps, but doing those reps without sacrificing your alignment. Breathe. I know I shouldn’t have to say this, but I have learned from my own practice and observing my students that whenever something new is introduced or the going gets rough, we forget to breathe. When I teach Earth & Fire, all the movements are timed to the breath. That might mean those movements are slow, and that’s okay. First and foremost, keep breathing throughout the practice, and fire up your Ujjayi breath. I love my yoga with weights practice. The strength training has supported my regular practice by building the muscles that allow me to have fun in inversions and all sorts of balance poses. It’s also great cross-training for the running and hiking I do, and the yoga and weights give me a double-dose of bone density maintenance. 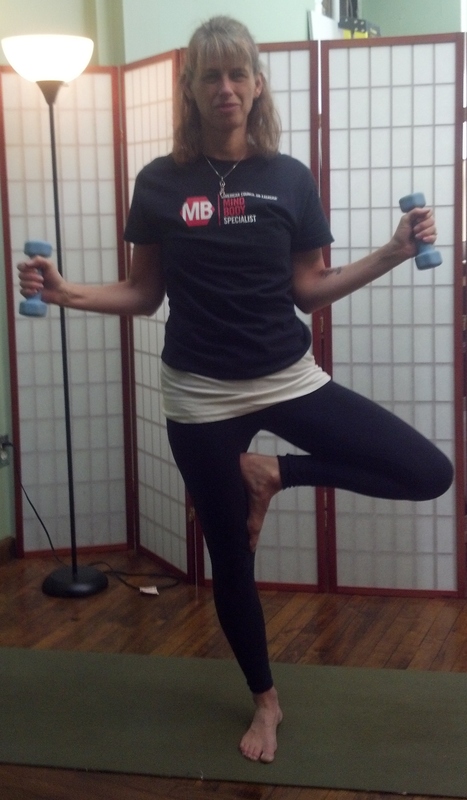 Keeping those three things in mind, give a yoga with weights class a try. Restorative yoga is lovely and deeply relaxing. I enjoying teaching restorative classes and workshops, and one of my favorites is a workshop I created where participants learn how to prop restorative poses with just one folded blanket. This gives them the opportunity to recreate the practice at home without having to invest in bolsters, blocks and straps. I thought I would share a short one-blanket restorative sequence with you. I particularly like this sequence because the transitions are smooth and easy. You’ll go around in a circle as you move from pose to pose. Rather than write it out, I set up my camera in the backyard to record a video of the sequence for you. It was a good idea. It was a gorgeous, sunny day. However, our cat was outside enjoying the weather, too. 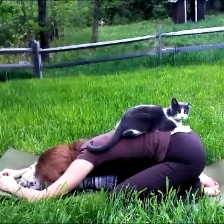 If the cat knows there’s yoga happening, she has to get in on the action. I’ve nicknamed her “the 4-pawed Reiki master” because she loves to give paws-on, energy-laden adjustments. Needless to say, I didn’t get to record the video without the cat. If you’d like to try the restorative poses, ignore the cat, who shows up just past the 3-minute mark, and listen to my voice. If you like cats, then enjoy watching her climb on me, rub my face with her head, and get in the way during transitions. Either way, thanks for watching. During the years I trained for triathlons, I spent many hours on my bike. I wish I knew then what I know now. Last year I explored cycling and yoga as part of a continuing education program and have put together a series of workshops for cyclists. The first workshop addresses the pain and strain that can develop in a cyclist’s ankles and feet. Trikonasana (Triangle) By bringing your focus to your feet and ankles, you can enjoy some lovely lengthening in your calves and ankles. Root down through the ball of the forward foot and the outer edge of the back foot. Draw your inner ankles up and your thighs toward each other. Keep your lower body engaged as you lengthen your spine. Prasarita Padottanasana (Standing Straddle Fold) Stretch the outside of your ankles and your calves while strengthening your inner ankles. Stack your hips over your heels and press the outsides of your feet into the floor as you lift your arches. Tip your tailbone up. Deepen further by contracting the quadriceps (muscles in the front of the thighs), which pulls your kneecaps up toward your hips. Urdhva Mukha Svanasana (Upward-Facing Dog) Point your toes back and press the tops of your feet into the floor. 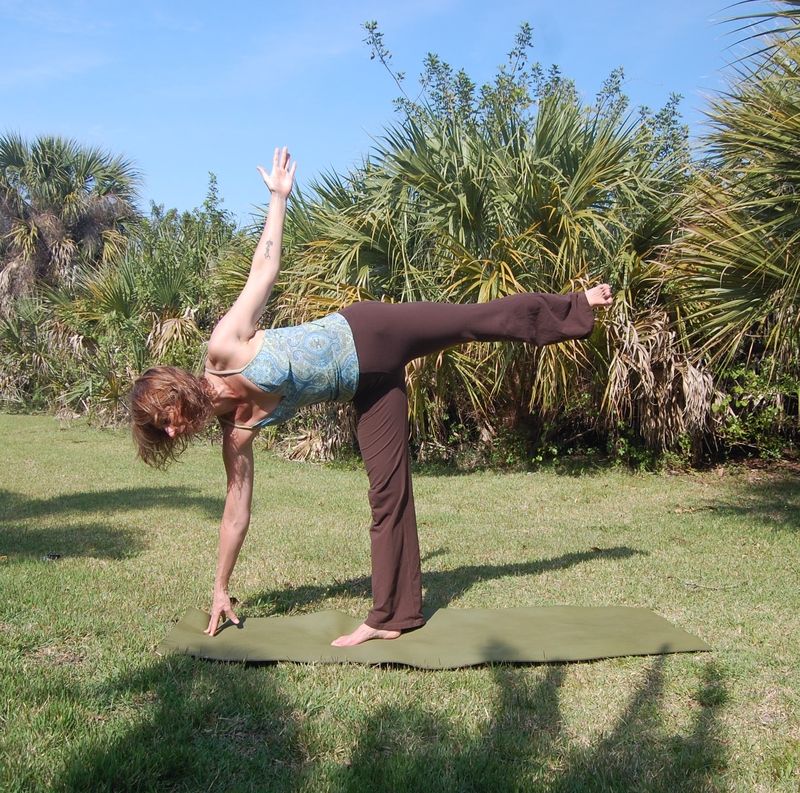 As your hips move forward into the backbend, your shins and the front of your ankles lengthen. Airplane to Hip Flexion Balance Flow Any time you balance on one foot, you are strengthening the entire ankle complex. Moving between two balance poses adds another layer of challenge. Begin in the Airplane variation of Virabhadrasana III (Warrior III) with the arms extended back like wings. Lifting the upper body, draw the knee of the extended leg forward and up towards your chest, then transition back to Airplane. Move slowly back and forth, matching your breath. A regular yoga practice is wonderful cross-training for any of the endurance sports. Make a daily date with your mat. What’s so great about yoga? You have to keep practicing to find out. From what I’ve observed during my six years of teaching yoga, it’s not hard to get someone to try yoga for the first time. It’s getting him or her back for the second round that’s the challenge. Because most yoga teachers, myself included, can’t take the time during a multi-level class to fully explain to newcomers what to expect, here is what you really need to know before your first yoga class. The first time you try yoga, it will most likely feel very awkward. Just standing with bare feet on a sticky mat feels weird. Getting your body into the same shape as the instructor’s will seem impossible. You might feel uncoordinated, unbalanced, ungraceful and totally inflexible. The next day, you might be sore in places you didn’t know you had muscles. And, if you can’t set all those feelings aside, you might never try yoga again. Yoga is not an instant cure-all. A yoga practice can make your body stronger, more flexible and healthier, but it won’t happen overnight. One time is never enough. The only way yoga can work is if you keep practicing. The trick is to get through that first class without letting your critical ego get in the way. Your body is going to think yoga is great and that it wants to do more. The muscles, although they might be sore, will have really enjoyed the stretching. It’s your mind that will shut down your desire for more yoga. Your mind likes to carry on about anything it can, so it will chatter away, telling you that you didn’t look good in the poses, that you aren’t flexible enough to do these kinds of things, or that you need to lose 25 pounds before you try again. The problem with the mind is that it always wants to be the center of attention. It looks for things to think about so it never has to be quiet. Yoga takes your attention away from the mind and directs it to the body. The mind fights back by dragging you outside yourself. It worries about what other people think and tries to convince you it knows what’s going on in other people’s heads. Once it does, you feel self-conscious and inadequate, because you can never live up to the expectations you have imagined other people have for you. The truth is nobody else in your yoga class, besides the teacher whose job it is to make sure you are doing the poses safely, cares what you look like on your mat. Other beginners are suffering the same insecurities you are, and more experienced practitioners are usually thrilled when someone new tries this practice that they love. Once the class is underway, all those with experience are focusing on their own bodies and probably won’t even look at you. Many go through their practice with their eyes closed. They are not watching you to see if you mess up. While laughter is certainly not off-limits in yoga class, and is, in fact, a welcome release when the class is getting too intense, nobody will laugh at you for being a beginner. Yoga students sometimes laugh at themselves when they struggle to balance in tree pose or mess up their rights and lefts and end up facing the wrong way. Laughter is a wonderful, heart-opening practice when it comes from love and camaraderie. Yoga students may laugh together, but they don’t laugh at each other, despite what your ego may tell you. Practicing yoga is also an exercise in humility. Unlike sports, you are not going to get much recognition for doing yoga, no matter how well you do it. You can practice yoga for 20 years and you will never get a trophy, or even a ribbon. You are unlikely to have your journey to yoga greatness documented by a gaggle of photographers. On your mat, it’s just you against……you. Nobody wins. No sports page coverage. Putting all the ego stuff aside is what makes yoga different than just stretching exercises and, in the end, is what brings people back to the mat. When you learn to ignore all the stuff the mind is going on about, it shuts up. You get to have a few moments of quiet and you discover what yoga really is. That’s what it comes down to. The whole time you’re on your mat, struggling awkwardly into poses, fighting off critical thoughts – while toning and strengthening your body, of course – all you’re trying to do is have a moment of silence. Once you discover the silence, you’ll keep coming back to your mat. The next time you practice, you can be pretty sure you’ll be right back to struggling with your ego, trying to find the silence again. But over time the poses will feel a little less awkward. You may be a bit more balanced. You may feel a touch more coordinated. You will begin to move with grace. And you may discover that you are more flexible than you thought. All because you didn’t let the first class be the last class.